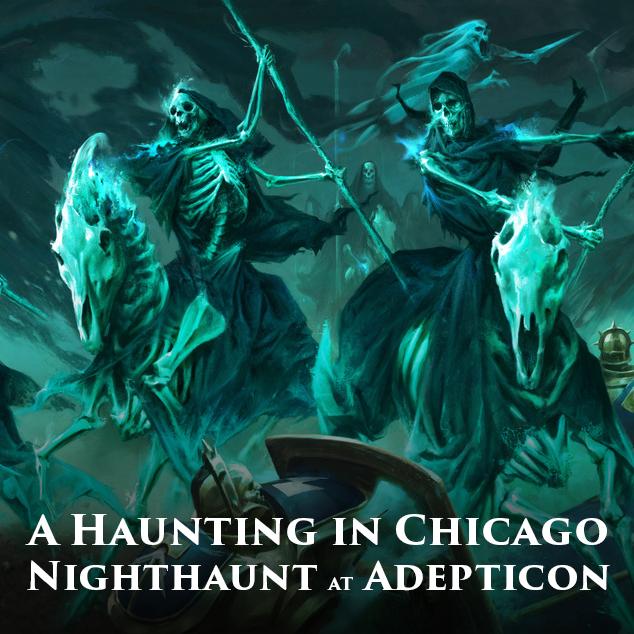 Last week I talked about the 1,000 point Nurgle list I took to Adepticon, but for the main event I took an entirely different army, my Nighthaunt. This is an army I originally built as my 1,000 point list for last year, and this year they finally got to have a go at the Championships. So, how did the full ghosty army do? Since I started collecting this army I have had allegiance abilities added, warscroll changes, a new hero, and two new versions of the Mourngul warscroll. So, I've played through a few different iterations of them. I took them to the Michigan GT, which was their first real outing at a full 2,000 points, but stuff has changed since then. Even the primer my local store held was before the newest Mourngul change, so Acon was my first time using the army with all of the recent changes. I have to say, it did better then I expected it to and had a ton of fun playing it. With the points drop on the Mourngul I was able to fit the Knight of Shrouds in without dropping much, all I had to do was swap out my second Banshee I usually run for a third Wraith, which is probably a better investment of points to be honest. In my first game of the tournament I played Daniel Martinez and his Blight Cyst Maggotkin army. He had mostly Blight Kings backed up by 30 Plaguebearers. We were playing the Starstrike mission. Unfortunately for him, this was just a really bad match up. The Blight Cyst is essentially paying points to get rend, which does nothing against me. I was also able to negate his exploding sixes on his Blightkings with my Mournguls with thier -1 to hit aura. The one thing I was really unsure of was the big blob of Plaguebearers. I knew my Spirit Hosts wouldn't do anything against them since they were -1 to hit in combat, or -2 when he used the Lord of Blights' command ability on them. He also had 10 Blightkings that were deploying off Gutrot Spume's ship. I made sure to deploy and move around enough on my first turn to deny him any space on my table edge to come in on, but he still had them come in on the left side pretty close to me. They charged my Hexwraiths over there, but only managed to kill one. In my turn I counter charged with both Mournguls and a Wraith and wiped out the whole unit after battleshock. The Hexwraiths then got caught up in the large blob of Plaguebearers. Their goal was just to stop them long enough for the Mourngul to get in. At a 3+ to hit and no mortal wound output, the Mournguls were my best option to deal with that threat. The Hexwraiths retreated out of combat, doing some mortal wounds on the way out, and headed towards the middle, where the central comet landed. Once my comet landed in the back left corner though, they made a u-turn, ran back over top of the Plaguebearer unit, and sat close enough to the objective to claim it, but far enough away to not get drawn into the combat. Over the rest of the game the single Mourngul and a Wraith chipped away at the demon unit, almost killing the whole thing. In the center I surged all of my Spirit Hosts forward, alongside the Knight with his +1 to hit, and the other Mourngul. They managed to claim the objective turn two so I started scoring right away, then when he came in to try and take it, they wiped out the five Blightkings, his Lord of Blights, and his Sorcerer Lord. On the righthand side I didn't have as much luck. He brought his Nurglings in near me, and knowing how much of a tarpit they can be I tied them up with a Wraith. My Hexwraiths on that side were annihilated thanks to exploding sixes and Blades of Putrefaction doing mortal wounds. Sadly no Mourngul there to stop it. He had brought them forward far enough though that when his comet dropped in that same corner, I was able to bring on my small unit of Spirit Hosts and Banshee behind him and close enough to claim it for a turn. In the end I won 19 - 7 in victory points. Daniel was an absolute blast to play and a great opponent. I would definitely play him again in a heartbeat. Like I said, he just got quite unlucky in his matchup against my army. The second game had me facing off against Christian Wear and his Phoenix Temple army in a modified Three Places of Power. It was essentially the Three Places of Power setup, but with Duality of Death rules. I knew this was going to be a really tough game for me, especially after doing my write up on Phoenix Temple right before Acon. Christian had two units of 20 Phoenix Guard, another unit of 10, three Frostheart Phoenixes, with his general having the extra 6+ save and the Phoenix Stone, a Drakeseer, and a Loremaster. It's actually pretty close to what I said I would run in my own article. He had way less drops then me, and wisely took first turn. Well, once three Phoenixes are sat on the three objectives, there's not much more I can do. I decided to focus on only two of them. My Spirit Hosts went for his general on the middle objective, and with the +1 to hit and the one round of combat where they were re-rolling missed hits from the Lightshard, I managed to take it down to one wound over several turns, before it retreated just far enough away to still hold the objective and be out of combat. On my left side I threw both Mournguls at the Phoenix there, hoping that together they could do something. Nope. They put a few wounds on it, but eventually they died too. The Phoenix Guard hit super hard. So many attacks, and at such a good hit and wound characteristic too. After turn three, I think, I conceded since there was no way for me to win, or get my secondary or tertiary. Christian was a lot of fun to play, and afterward I talked to him about his army and how he likes it. He basically said this mission is the perfect one for his army and it's great at taking a hit, but struggles when it needs to be really offensive. That's why he put the Drakeseer and Loremaster in. I've really struggled against Phoenixes with both my armies now, and I think the trick is just overwhelming shooting attacks. Having a high mortal wound output like my army does doesn't mean much when they all get a 4+ save against them. In the final game for day one I played Dan Moyes and his Flesh-eater Courts in Take and Hold. I didn't know what to expect since I've never played against Flesh-eaters, and his list was also something I had never really seen. He took the Royal Menagerie, and had three Terrorgheists, plus his Ghoul King on a Terrorgheist. To fill out the battleline he had two big blobs of Ghouls, a smaller, minimum sized unit, and a Ghoul hero. He had less drops then me so got to go first. I deployed defensively around my objective, expecting to have to fend off his Terrorgheists and then hopefully launch a counter attack. Two of the Terrorgheists made it to my lines turn one, charging into the Hexwraiths. I had everything else lined up behind them, but they were out of reach this turn, except for my Knight of Shrouds, which was just within their 3" attacks, as well as their shooting. They killed one or two Hexwraiths, and nearly killed the Knight, putting five wounds on him, which would normally kill him if it weren't for the Lingering Spirit command trait giving him an extra wound. In my turn I retreated the Hexwraiths overtop of the Terrorgheists and towards his lines, retreated the Knight back just far enough to be out of range, then charged the two Terrorgheists with both of my big units of Spirit Hosts and both Mournguls. I managed to get all 12 Spirit Hosts in base to base and popped the Lightshard to get re-rolls. I went with the unit closest to me first, they were split up evenly, three on one beastie, three on the other. With the +1 to hit and all the re-rolls, this one unit of Spirits managed to kill both Terrorgheists! It was pretty satisfying. After that one unit of Spirits with the Knight alongside the Mournguls advanced upon his remaining two, while the other unit of Ghosts retreated back to my objective. Over the next few turns I killed both his King and the other Terrorgheist, while somehow managing to keep my Knight alive. 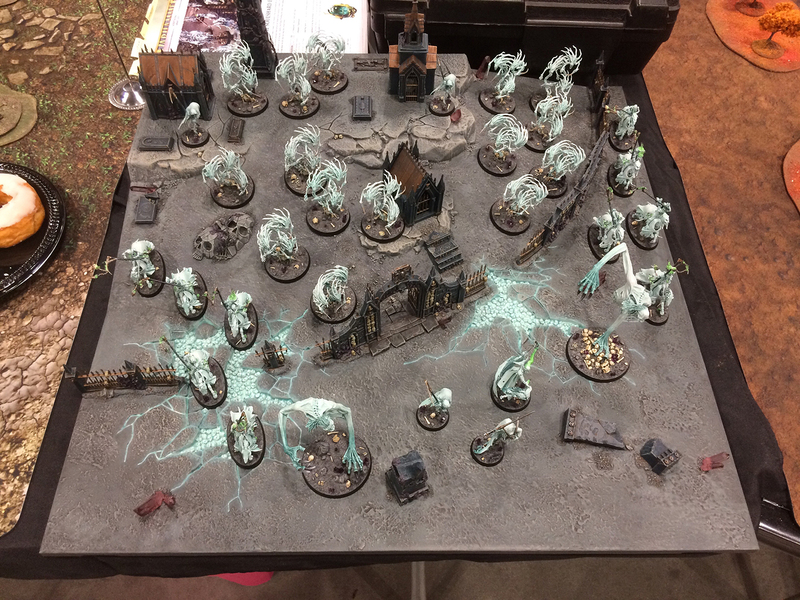 On the left flank my Hexwraiths, along with some Wraiths, and my Banshee and small unit of Spirits which popped up, started ticking away at the ghouls. Once the Mournguls got onto his objective it was over and I was able to clear it off on turn four, getting me a major victory. I had no clue how this game was going to go, and I think if my Knight had died on turn one it could have gone very differently. He was really key in being able to take down his big monsters. Afterward, Dan and I chatted Death and talked over the game. This was another great game, with another great opponent, and a great end to the Saturday. 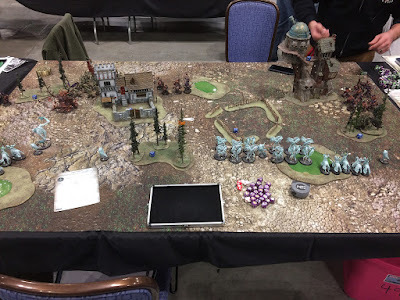 Day two of the tournament started out with me facing off against amazing guy and gamer, as well as arch Warhammer tournament nemesis, David Griffin. Back at the first AoS Acon event a few years ago, the two of us were playing on table two for the last game, and after I lost to him he went on to win the whole event, so this was a bit of a grudge match. If you know David though, you know how fun he is to play against. This year he brought Stormcast, which I was fairly comfortable facing. They're a good match up for my Nighthaunt generally. He had a Stardrake, two units of Judicators, some Raptors, a unit of Liberators, a Relictor, a Castellant, a Heraldor, a big unit of six Palladors and a Wanderers wizard. We were playing Scorched Earth, so I was a bit worried about his Palladors' ability to run onto objectives at the last minute. He got first turn and had some truly awful luck at shooting. He should have done way more damage then he did, but just couldn't hit or wound anything. I tried to go up the right flank with a Mourngul and some Hexwraiths, but the Palladors got in the way. I managed to tie them up for a few rounds with a Mourngul, but in the end he chewed through it. In the center he launched his Stardrake at me and he took out a fair amount of my Spirits. That bite attack really hurts against me. Over a few rounds though, thanks to the Knight, who once again lived thanks to Lingering Spirit on one wound, the remaining Spirits took him out. The Relictor Lightning Charioted behind my central objective, but gotten taken out by some Hexwraiths. I tried to kill him with my Knight so I could regain wounds thanks to his Sword of Stolen Hours, but couldn't roll any hits. On the left I charged my Hexwraiths forward to try and take that objective from him, while in the center my Mourngul and a Wraith tried to take out the heroes and Judicators there. I also brought my Banshee and small unit of Spirits on near his back objective on the right side, but all they managed to do was tie up the units over there. His Palladors charged onto my central objective turn five and burned it for three points. We had been tied all game, so now he was up by three. In my turn I made a mistake and didn't retreat my Wraith onto his central objective. I misread the scenario and thought there couldn't be any enemy models nearby in order to burn it, when really I just needed more models then him. I did manage to clear out the left objective though, rolled to burn it, and only got two points. It was a super close game down to the very last dice roll. If we had tied it would have gone to victory points killed, and I think it would have been fairly close there too. We both made some mistakes during the game and forgot to use some units in some turns, but it was probably my most intense and down to the wire game all weekend. Next year David, next year I shall beat you! I did manage to score both my secondary and tertiary objectives though, so I at least walked away with some points. My final game of the tournament was against Tim Cornstubble and his Blades of Khorne army in a scenario that had four objectives in the corners. If you controlled all four it was a major, otherwise it went to number of objectives you controlled. He was playing a Brass Stampede army with a bunch of Juggernauts. He also had a Gore Pilgrim battalion in there too. I haven't played against this many Juggernauts before, so once again it was something new. We both knew that whoever got the charge off would have a big advantage, so for the first two turns it was us slightly moving stuff around, getting ready to react. I had castled most of my army up on the left objective, with just some Hexwraiths on the right to hold and both Mournguls over there to try and launch an offensive. Eventually, I blinked first since I didn't want to spend a whole game not fighting. I tried to charge both of my Mournguls in, but only made it with one. Long story short on the right side, both my Mournguls and some Hexwraiths went up against three units of Juggernauts, his Lord on a Juggernaut, and two Slaughterpriests. Though I killed a lot of it, eventually he broke free with his Lord and the remnants of one unit and made a run for my objective. On the left side I sent my Cairn Wraiths into his Blood Reavers, while I hung the Spirits back. The Hexwraiths over there were a decent speed bump, but eventually I had three units of Juggernauts charging into my thin ghostly line. Luckily with +1 to hit and Lightshard, they did pretty much what I though would happen, and disintegrated against the Spirit Hosts. He had my right objective though, so I ran the remaining Hexwraiths that were in his deployment zone, back over there, though they just ended up dying. On the last turn he had three objective to my one. I retreated my remaining Morungul onto his objective on the right side, but in his turn he was able to run enough units over there to be in range of the objective, outside of combat from the Mourngul, but within range to outnumber me. In retrospect, I should have kept the Hexwraiths over there, and helped use them as a screen to keep units away from his objective. He won a minor victory, and once again, there wasn't much left on either side. Juggernauts hit a bit harder then I was expecting, that may be thanks to Brass Stampede though. Either way, it was a great game and a nice finish for the weekend. I did much better with the Nighthaunt army then I was expecting. In my local scene there is a lot of mortal wound magic and shooting that just picks off all my heroes fairly early on in the game. 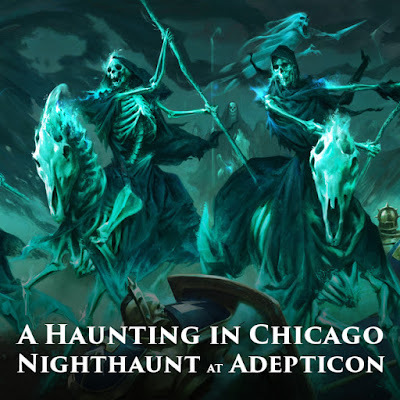 They also know how to deal with Nighthaunt now. I was happy that I actually got to use my Knight of Shrouds pretty effectively in all of my games. That Lingering Spirit command trait was key with the number of times he was left on one wound. The +1 to hit is huge, especially coupled with the re-rolls to hit since you re-roll before doing modifiers. That means I was doing mortal wounds on fives and sixes, but still re-rolling fours and lower since normally a four is a miss. Basically anything that wasn't a mortal wound was getting re-rolled. I'm not sure what I would change about my list. I'm pretty happy with how it all worked honestly, and If I had played a little more carefully, or been a little luckier in spots, I may have finished higher then I did. To be fair though, I may have also ended up facing a shooting heavy army or a Changehost, in which case I would have lost pretty quickly. I ended up finishing 58th out of 165 people, so not bad. 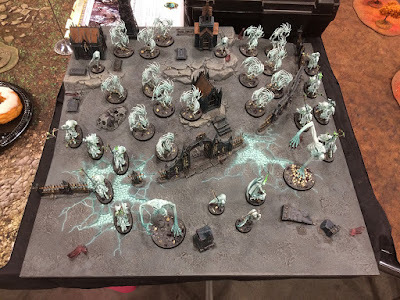 I saw two other Nighthaunt players while I was there, though they both had allies. I would be interested in finding out how they placed, so if anyone knows, let me know. I'll be playing my Nighthaunt for awhile while I build up my Nurgle army, and I'll keep playing them after that too. They're still a ton of fun to play, and paint! I had to paint one more Cairn Wraith for the event the week beforehand, and I was reminded how rewarding this scheme is to paint.